When OAFE started, the very first review we posted on the site was a woman. Since that day, we have never stopped agitating for more female figures. We've recently been joined in this by some vastly misguided crusaders, but the important thing is that at last, a company has listened. Shockingly, that company is Mattel. Batgirl is a tech genius and an amazing detective. Even though she doesn't have super powers in the traditional sense, Batgirl is an amazing problem solver that never gives up. She always pushes the limits beyond what everyone expects of her. Announced last April, DC Superhero Girls is a standalone universe where girls are the stars. So basically, like DC's Ame-Comi or Bombshells lines, but aimed at kids. Characters like Supergirl, Wonder Woman and Katana are now teenagers (because kids love to read about characters who are just slightly older than they are) who attend Super Hero High, where they study things like "Heronomics" and learn how to use their powers. Not that they all have powers. Every property needs a Batman, and Superhero Girls' Batman is Batgirl. You know what we mean. Sure, they could have gone with Batwoman (hey, if Wonder Woman can be a teenager, so can Batwoman), but Barbara Gordon is more recognizable. In fact, she might be too recognizable, since there's no way that skinny little mask she wears is doing anything to help protect her secret identity. Although, I guess only Batgirl and Harley Quinn are wearing masks so far, so maybe it's just a Gotham City thing? 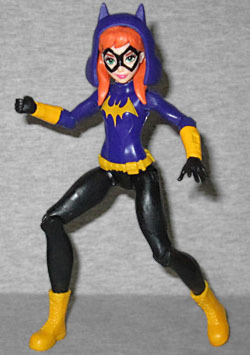 All the SHG get new costumes, but Batgirl's is very similar to the one she's currently wearing in the comics: chunky yellow boots, a purple jacket, and black pants. The jacket is meant to be a hoodie, though for this toy, the hood (with its little bat-ear points on top) is a separate piece, sort of ruining the illusion. She's got yellow bracers, black gloves, and of course there's her utility belt. She's actually built like a teen girl, too - she's not just a short adult, and she's not wearing spandex. Her pants and coat have sculpted seams, her boots have sculpted laces, and her bracers appear to have screens or something on the back. Superhero Girls features both 12" dolls and 6" action figures, but from day one, the line has thumbed its nose at other doll lines by pointing out that all these can "stand on their own!" So take that, Mattel's Barbie and Mattel's Bratz and Mattel's Monster High! Mattel's Superhero Girls will certainly show you! Anyway, the articulation on Batgirl is decent: she has swivels at her boots and wrists, swivel/hinge joints in the knees, hips, elbows and shoulders, and a balljointed head. One of her shoulders was stuck, and required boiling water to get moving, and her head grips the joint so tightly that it's hard to move it at all. 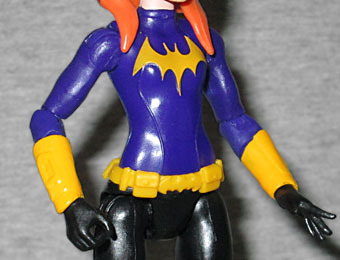 If you don't count the removable hood, Batgirl's only accessory is her backpack - high schooler, remember? It's a cute design, a black pack with little bat wings attached to the back. It slips on and off of her shoulders easily, and there's a small slot in her back to help keep it in place. The DC Superhero Girls line is calculated to bring a broader female audience into comics, and to prove that "girls don't buy action figures" is as stupid a statement as "boys don't play with toys of girls." The merchandise just hit stores this month, and is exclusive to Target until July. 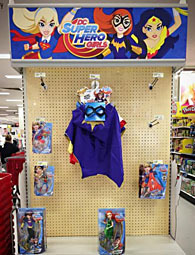 If you want any, look for an endcap in the girls' section (yes, proving unfounded the fears of the type of moron who would complain about "political correctness," Target's big initiative to eliminate gender-based signage has not led to a full desegregation of the toy aisles, nor to dogs and cats living together). Mattel is catering to an under-served but existing market, and so far the results are good.